What Makes Music Together at Family Music Time Unique? The music is amazing! Music Together songs and CDs have won multiple awards and are universally recognized for their quality. The songs are great fun to sing and play with, and they’re very carefully selected to give children an experience of a variety of musical styles, tonalities, and meters. During class time, most of the music is sung without the benefit of a CD, so children can experience real human beings making music. Families also get professional quality recordings to use at home, featuring professional musicians playing real acoustic instruments. It’s adult-level music that children love, and it bears repeated listening without going stale. (As an adult, you can listen to our CDs over... and over... and over... without feeling that your sanity is being compromised!) And with a new song collection featured every ten-week session, you get new songs to enjoy with every new semester. 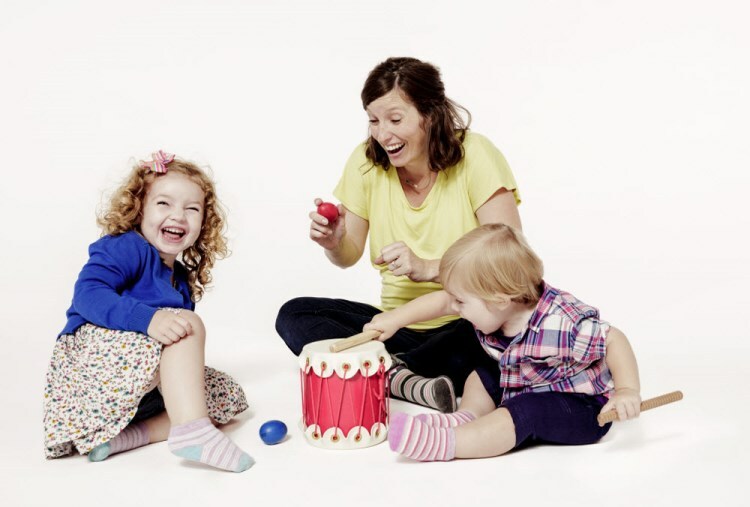 The Music Together curriculum is based on decades of research into how children learn music. So as a teacher I know that what I’m presenting is not just “music fun”, but it’s a complete, developmentally appropriate curriculum. Click here to read more about Music Together's ongoing research. With mixed age classes, children are encouraged to encounter the music in the way that most fits them developmentally. Since all learning styles and development speeds are respected, children feel safe and confident in gaining music skills. There’s no “wrong” way to enjoy the music. As much as children enjoy the classes, a big part of our mission is to give parents the tools and confidence to enjoy sharing music-making at home with their children - because that's where most of the learning really takes place. We think of the class as really just a jumping-off point. We help you learn fun ways to interact musically with your child, and learn how to recognize your child's musical development milestones. Music Together classes teach children basic music skills, but they’re designed to be fun for grownups too. You don’t have to be musically skilled to enjoy the classes. Many parents say it‘s a high point of their week! Tuition includes CDs and a beautifully illustrated songbook with activities to enjoy with your child at home - at bedtimes, bath times, and just-having-fun times. For me, Family Music Time is about more than music - it’s about creating a better world with the tools of music education. This philosophy runs through every aspect of Music Together, and makes it a very inspiring organization to be a part of. I know that I’m making a difference with the work that I do – as well as having a huge amount of fun in the process! I invite you to visit a class, and see for yourself how Family Music Time might become a part of your family's life!